So, for folks like me who can’t read Greek, here’s an introduction to trigonometry. You know these from the famous mnemonic acronym “SOHCAHTOA”, which is where I’ll start from. Very buzzwordy, and nonsensical when every time you use them, you pass in an angle. And yet, 100% correct. The cosine, sine, and tangent functions work by creating an imaginary triangle whose hypotenuse has the given angle, and returning the ratio of two of that triangle’s sides. All three functions create this triangle, and then return the ratio of two of its sides. Note the proximity of the three sides to the origin. The opposite side is the vertical side, literally on the opposite side of the triangle from the origin. The adjacent side is the horizontal side, extending from the origin to the opposite side. It’s the adjacent side because it touches (is adjacent to) the origin. The hypotenuse is the (usually) diagonal side that extends from one end of the adjacent side (namely, from the origin) to one end of the opposite side (namely, the end that isn’t touching the other end of the adjacent side). Let’s consider a different case for each function—namely, for each function, the case in which it returns 1. With the hypotenuse at 0°, there basically is no opposite side: The hypotenuse is in exactly the same space as the adjacent side, from the origin to the lines’ ends. Thus, they are equal, so the ratio is 1. With the hypotenuse at 90° (or τ/4), there basically is no adjacent side: The hypotenuse is in exactly the same space as the opposite side, from the origin to the lines’ ends. Thus, they are equal, so the ratio is 1. Cosine and sine: What if we swap them? Try sin 0 or cos τ/4. What do you get? Zero, of course. The 0° triangle has effectively no opposite side, so the sine of that (tri)angle is 0⁄1, which is zero. Likewise, the 90° triangle has effectively no adjacent side, so the cosine (adjacent/hypotenuse) of that (tri)angle is 0⁄1. You should be able to guess what the triangle for which tangent returns 1 looks like. Go on, take a guess before you scroll down. A 45° (tri)angle’s adjacent and opposite sides are equal, which is what makes the tangent function return 1. Cosine and sine return the ratio of one side or the other to the hypotenuse. Accordingly, the length of the hypotenuse affects the result. But, again, these functions take only an angle, so where do you tell it what hypotenuse to use? And why do these functions, on any calculator and in any programming language, return only a single number? 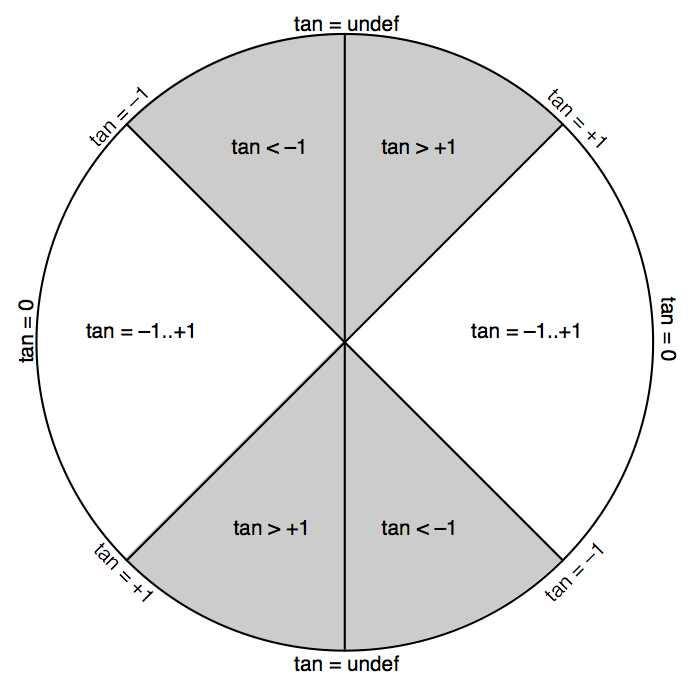 The trigonometric functions are defined in terms of the unit circle, which is a circle with radius 1. If you look at the diagrams above, you’ll notice that the hypotenuse of the triangle always extends to the perimeter of the circle—that is, it’s always equal to the radius. 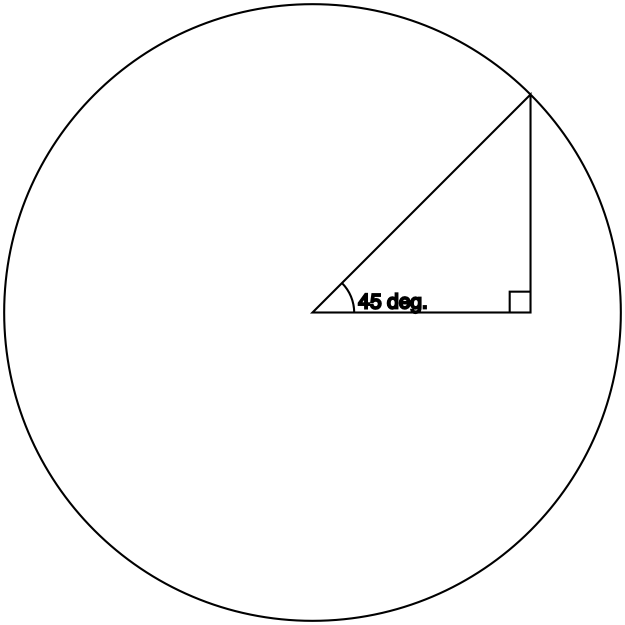 This is no accident: The hypotenuse of the constructed triangle is the radius of the circle. And since the radius of the unit circle is 1, that means the hypotenuse of the imaginary triangle is 1. Thus, the fractions that cosine and sine return are adjacent / 1 and opposite / 1. That’s why they return single numbers: the “/ 1” is simplified out. From this follows the method to compute cosine or sine for an arc with a different radius: Multiply the cosine or sine by the desired radius. Cosine and sine: What if we use an angle greater than 90°? What happens if we take the cosine and sine of an angle like, say, 4 radians (about 230°)? Geometrically, the origin is 0,0. As long as we’re in the 0–90° range, no problem, because both the x (cosine) and y (sine) values in that quadrant are positive. But now we’re in negative territory. With the hypotenuse in this quadrant, the adjacent and opposite sides are now negative numbers. cos π = cos τ⁄2 is -1, and sin (τ×3⁄4) is likewise -1. For this triangle, they’re similarly negative, though not -1. 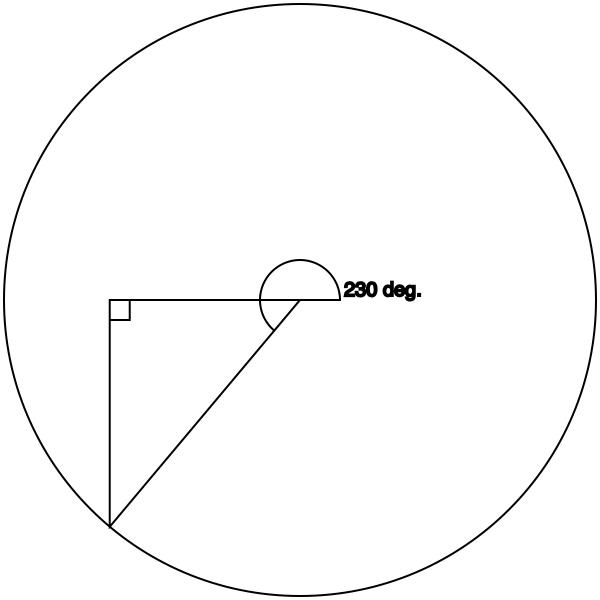 Tangent: What if we use an angle greater than 45°? As we saw above, if we give the tangent function an angle of τ/8, the ratio is 1. What if we go higher? Well, then the ratio goes higher. Very quickly. The half-curve at left is the quadrant from 0 to τ/4 (the upper-right quadrant). The curve in the middle is the two quadrants from τ/4 to τ×3⁄4 (the entire left half of the circle). The half-curve at right is the quadrant from τ×3⁄4 to τ (the lower-right quadrant). In words, the tangent function returns a value from 0 to 1 (inclusive) for any angle that is a multiple of π plus or minus τ⁄4 (45°). 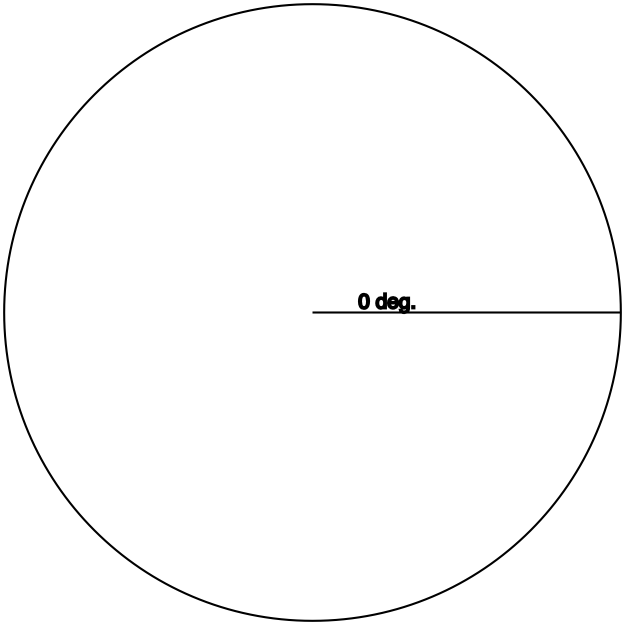 0 counts (it’s 0π), as does π, as does π2 (= τ = 360°), and so on. Likewise 45°, 360-45=315°, 180-45=135°, 180+45=215°, etc. 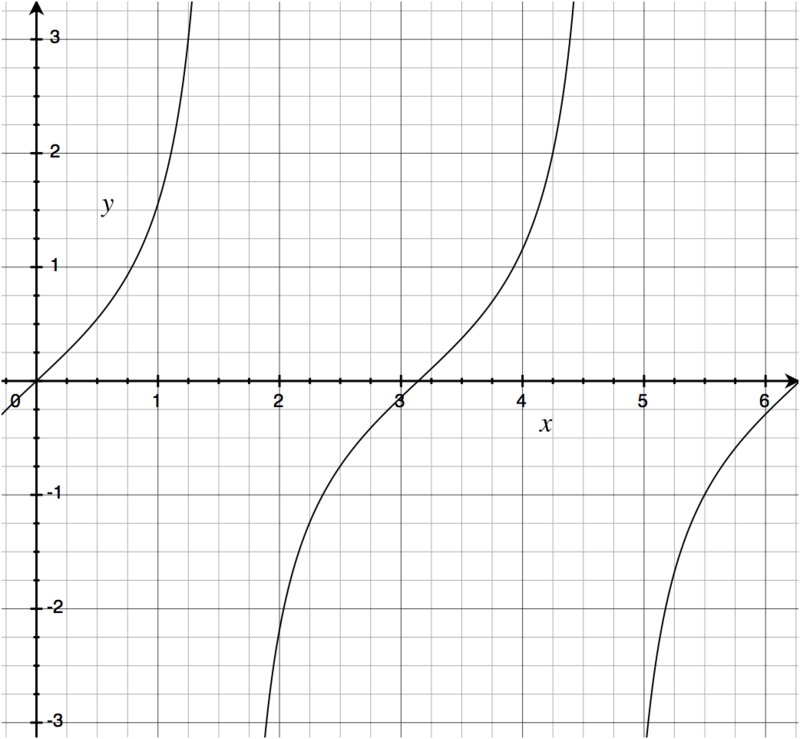 Outside of those left and right quadrants, the tangent function curves very quickly off the chart—it approaches infinity. Tangent is the only one of the three that can barf on its input. Namely, a hypotenuse angle of τ/4 (90°) equates to the opposite (vertical) side being 1 and the adjacent (horizontal) side being 0 (as shown above for the sine function), so tan τ⁄4 = 1/0, which is undefined. The same goes for tan τ3⁄4, which equates to -1⁄0. The tangent of an angle is its slope, which you can use to reduce an angle down to whether it is more horizontal (-1..+1), more vertical (< -1 or > +1), perfectly horizontal (0), or perfectly vertical (undefined). As a practical matter, whenever I need to compute a slope ratio, I special-case perfectly vertical angles to result in ∞. From the above definitions, the practical use of cosine and sine emerges: They return the width and height of the right triangle whose hypotenuse has that angle. As described above, these results are typically interpreted in terms of the unit circle (a circle with radius 1), meaning that the hypotenuse of the triangle is 1. Thus, if you’re working with an arc or circle with a different radius, you need to multiply your cosine or sine value by that radius. For example, let’s say your friend has a 50″ TV, and you’re wondering what its width and height is. Maybe she’s moving, or giving or selling it to you, or both, so one of you is going to need to know whether and where it’ll fit. The length of the hypotenuse is the radius of the circle; in the unit circle, it’s 1, but we’re dealing with a hypotenuse (diagonal measurement of the screen) whose length is something else. 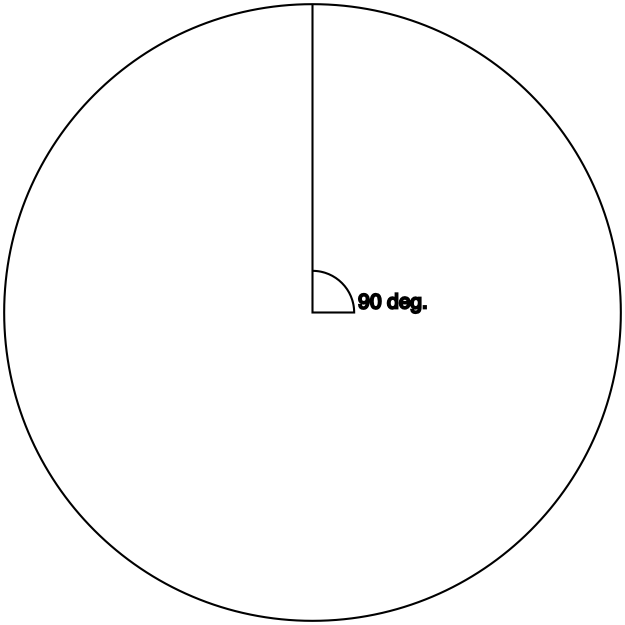 Our radius is 50″. Next, we need the angle. No need for a protractor; TVs typically have an aspect ratio of either 16:9 (widescreen) or 4:3 (“standard”). The aspect ratio is width / height, which is the inverse of the slope ratio: the ratio that the tangent function gives us (which is opposite / adjacent, or height / width). Dividing 1 by the aspect ratio gives us the slope. Only problem is now we need to go the opposite direction of tangent: we need to go from the slope ratio to the angle. atan takes a slope ratio and gives us, in radians (fraction of τ), the angle that corresponds to it. Let’s assume it’s an HDTV. (I don’t want to think about trying to move an old 50″ rear-projection SDTV.) The aspect ratio is 16/9, so the slope is 9/16 (remember, tangent is opposite over adjacent); atan 9⁄16 is about 29–30°, or about 0.5 radians. I promise that my choice of 30° for the first example and subsequently deciding to measure an HDTV as the example use case was merely a coincidence. Add an inch or two to each number to account for the frame around the viewable area of the display. So the TV needs about 45 by 30 inches of clear space in order to not block anything. Categories: Graphics; Math. | Comments: 2 (feed). “Cosine and sine return the ratio of one side or the other to the hypotenuse. Um, this is not correct. Because the trig functions all return *ratios*, it does not matter how big the circle is. For a given angle, the ratios between the triangle’s sides are always the same, regardless of size. There is no need to define the functions in terms of a particular circle size.